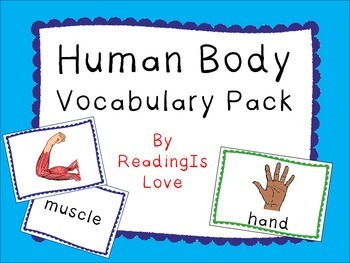 This is a set of word and picture cards focusing on vocabulary to complement your human body unit. 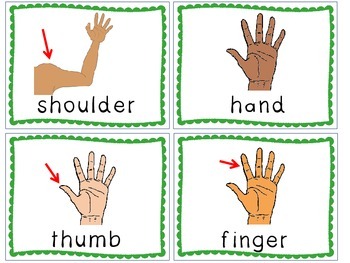 All vocabulary included is appropriate for students in the primary grades. Use these cards during science lessons or in a literacy center. 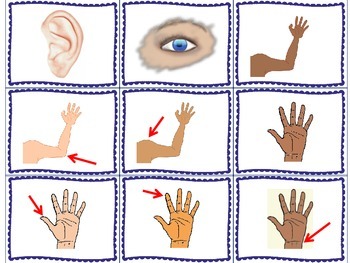 The set focuses on 32 human body vocabulary terms (see list below). 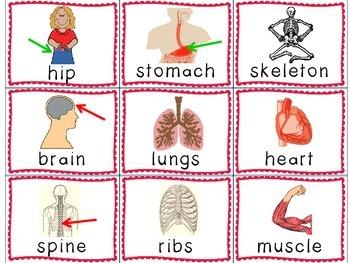 For each term, there is a large green-bordered card featuring the word and a picture, for use in introducing each term and to display on your science word wall. There are also two differentiated sets of smaller cards, featuring the same 32 vocabulary terms. The blue-bordered cards feature the word and picture on separate cards, for students to practice reading the words and matching them to the correct pictures. The red-bordered cards feature the word and picture on the same card, and can be used with younger students and struggling readers to support vocabulary acquisition. Directions for playing a memory/matching game are included.